She’s warmed the hearts of millions. You’ve seen her laugh. You’ve seen her cry. And now, for the first time ever online, you’ll see Lucy as you’ve never seen her before. 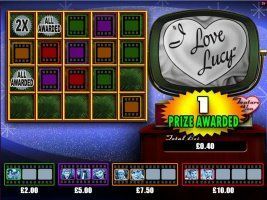 Jackpot Party is proud to introduce the I LOVE LUCY™ online slot game, available exclusively at Bet 365 Casino! In this Cascading Reels game, winning symbols disappear and symbols above them drop to take their place, possibly awarding even better wins as new reel combinations appear. 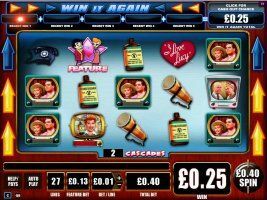 And in the I LOVE LUCY slot you’ll also find the WIN IT AGAIN™ feature, allowing you to win the combined total of your last five wins with just three cascades in one play! 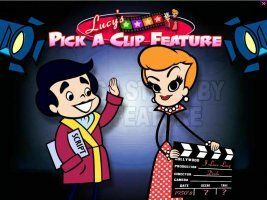 If that wasn’t enough, players can join Lucy in the ‘Pick a Clip’ Feature where they’ll be able to see scenes from classic I LOVE LUCY episodes – the more they see, the more credit awards they’ll win. To celebrate, they can then watch the completed scenes play out. As with all exclusive slot games at Jackpot Party, players have the chance to win the incredible Jackpot Party Progressive. The only accumulating jackpot online that can be won on any game, with any stake at any time – completely at random! Play the ‘I Love Lucy’ slot game exclusively at Bet365 NOW!